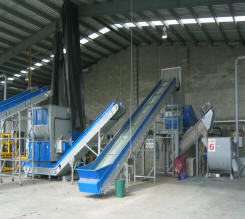 Beginning with the feeding and up to the finished product - the modular wash plants process dirty plastics easily! Agricultural films, packing films, or rigid plastics are processed here step-by-step. The success of the simple and nevertheless effective design is demonstrated in international demands for it: Germany, Hungary, Lithuania, Nigeria or the Benelux countries. The Friction Washer is used for rinsing and dewatering of materials such as film flake, PET bottle flake and other rigid plastics. The friction washer is normally mounted on a inclined frame and the material is transported from the lower input point on an inclined angle to the upper end. The inner paddle configuration transports the material flake in a upward direction and simultaneously performs the washing/rinsing process. Fines, water and water soaked paper are removed from the material through high speed centrifugal force and exit out the circular screen cage around the transport screw. The water, fines and paper exit out the discharge pipe located at the bottom of the friction washer. The friction washer is equipped with top mounted water injectors that assist to clean the upper screen area during operation. The Separation Tank uses the specific densities of plastics as a principal to separate the materials with water as the utilized tool. The material is transported into the separation tank with a screw type screw or friction washer. 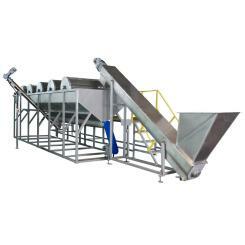 The material flake is transported within the separation tank through a series of paddles which simultaneously push the flake under the water level to achieve a full opening of the material and allow the separation process to take affect. During the material flake transport in the separation tank the material has the ability to either sink or swim. For example PE/PP will float and PVC/PET/PA/PS or organic materials will sink to the bottom of the tank. The swim or light fraction is transported along the surface to a discharge screw or auger located at the end of the tank. The sink or heavy fraction is discharged from the bottom of the tank by a inclined discharge/dewatering screw. 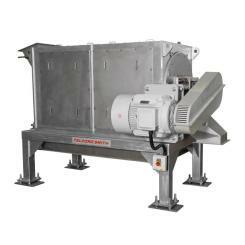 The Mechanical Dryer type TM1000 is used in a washing system with pre-shredded or in a wet granulator system for surface drying of plastics such as film, PET bottle flake, etc. The input material enters the upper end of the dryer by a transport screw, cyclone separator or other material handling equipment. The inner rotor of the mechanical dryer transports the material flake from the in-feed side to the discharge side. The specific angular degree of the rotor flights determines the total dwell travel time of the material inside the dryer and the final residual moisture content of the discharged material. During the material transport inside the dryer the material is forced against the rotor and screen surface to achieve a product contact surface cleaning. The water and residual water is forced out through the screen cage which surrounds the mechanical dryer rotor. 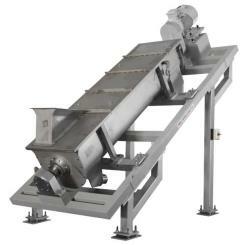 The Thermal Dryer is used for further reduction of the residual moisture content in material flake. 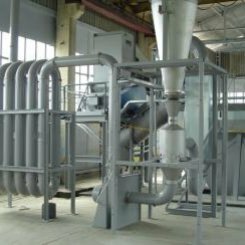 In most cases is the thermal dryer necessary for materials that will be processed through an extruder after the washing phase. Heating register, mixing element, transport blower, and a down stream spiral formed piping with final cyclone separator. The heating register is equipped with an adjustable temperature range which allows for consistent material heating temperature relative to the ambient temperatures. This feature ensures a satisfactory final residual moisture content and lowers energy costs.